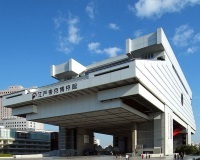 Tokyo's museum dedicated to detailing the city's history, art, culture, and architecture through the medium of visual displays is an impressive attraction not to be missed. Edo was the old name for Tokyo when the country came under the rule of the warlord, Tokugawa Ieyasu. Exhibits include a replica of an ancient Kabuki theatre, maps, photographs, and portrayals of the lives of the city's merchants, craftsmen, and townspeople in days gone by. It is a huge museum which takes a few hours to explore properly and should captivate people of all ages. There are numerous interactive exhibits and many intricate models with such wonderful detail that binoculars are provided for visitors to better appreciate them. Traditional performances are held in the recreated theatre, which is not the only historic building to be recreated life-size. If you are interested in Tokyo's general history then this is the best museum to start with to get an overview of the city's development. Volunteers give regular free tours of the museum and many of them speak fluent English. There is good English signposting and information throughout the museum. Opening times: 9.30am - 5.30pm. Saturdays: 9.30am - 7.30pm. Closed on Mondays.